What happens when four music lovers get together to share their love of music? They become Forever Plaid! Filled with nostalgic pop hits of the 1950’s, Forever Plaid is one of the most popular and successful musicals to hit the stage in recent years. Featuring snappy repartee and songs like “Three Coins in a Fountain,” “Sixteen Tons,” “Chain Gang,” and “Heart and Soul,” Forever Plaid will keep your funny-bone tickled and your toes-a tapping! What happens when two sophisticated New Yorkers are thrown in with a group of traditional, Pennsylvania Amish? Musical comedy! Plain and Fancy is celebrating its 30th Anniversary on the Joseph Stein Stage during the Round Barn Theatre 2016 Season! In celebration of over 3,000 performances before well over 300,000 spectators, every season ticket holder who comes to any 2016 Plain and Fancy performance will share a piece of Shoofly Pie with the Miller family! Winner of 4 Tony Awards, The Miracle Worker is the classic tale of Annie Sullivan and her student, Helen Keller. Blind and deaf almost since birth, Helen is like a wild thing with her family, unable to communicate and utterly alone in a dark and silent world of mystery – until Annie comes along and does her best to reach her mind and spirit. 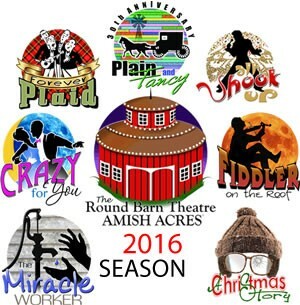 Amish Acres’ Round Barn Theatre in Nappanee, Indiana is only 10 minutes away from Scottish Bed & Breakfast. Making us your home-base for all your Northern Indiana adventures couldn’t be smarter. Our luxurious amenities, spacious lodging, and delicious breakfasts will show you why. Book your stay at Scottish Bed & Breakfast now! This entry was posted on Friday, February 5th, 2016 at 10:00 am and is filed under Adventures in Northern Indiana. You can follow any responses to this entry through the RSS 2.0 feed. Both comments and pings are currently closed.